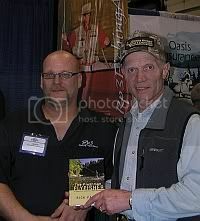 On my visit to the BC Boat & Sportsmen’s Show in Abbotsford I met up with Rick Passek from the Flyfish Fanatic blog. I was particularly interested to see Rick’s new book The Freshman Flyfisher – A Beginners Guide For A New Generation, which he introduced at that show. Rick was on hand to sign books as well as talk about fly fishing. After a brief conversation and a quick photo session the booth started to get really busy and I did not want to take Rick’s time away from potential customers and clients so I purchased the book and let him tend to his promotions. Once at home I immediately began to look through the pages. As soon I opened the front cover I knew that I had a very unusual book in my hands. Unusual in the respect that this is the first book I have read that incorporates the Internet; throughout the book there are web addresses listed to more information about the topics covered. I thought that was a very clever and fortunate idea considering that the Internet has become a major information source for the informed outdoor person. 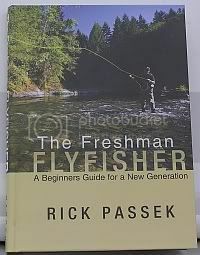 In the 123 pages of "The Freshman Flyfisher – A Beginners Guide For A New Generation" Rick covers everything from rods, reels and other necessary accessories to fly patterns, basic lake biology and of course, how to actually find fish. 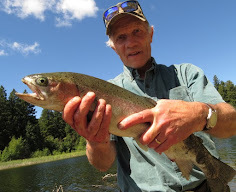 Also covered are aspects of boating and other fly-fishing floating devices; explanations of fly-fishing terminology and the use of special tools such as the throat pump to name one. In short it is a very comprehensive guide for the beginning fly fisher. What I particularly like about the book is the easy to understand and follow language. To me this is important and something many writers often forget: novices are not necessarily familiar with specific terminology and in order to get them interested we should remember to use language that is easily understood. There is a comprehensive glossary of terms that even experienced fishermen will appreciate. On a more personal note, after reading this book I finally understood the passion my own father had for fly fishing and today have great admiration for the fly fisher who knows how to cast a line with elegance and precision. In my opinion this is the book every beginning or advanced fly fisher should have in the bookshelf. Out of five points I give this book a well deserved five. In the following days I will introduce you to Rick Passek’s new company Rp3 Fishing Adventures based in British Columbia.